Mike's LASIK Hell was created to help expose the dishonest, corrupt, and dangerous LASIK industry that many patients have fallen victim to. Without websites like this and many others, potential patients would only see the false information advertised by the doctors and industry who profit from LASIK. If you want to know the truth about LASIK and refractive surgeons please visit http://www.lasikscandal.com and helpstoplasik.com I have documented my own experience of having my vision permanently damaged by two LASIK procedures performed in 2010 at First Eye Care in Dallas, TX. Potential patients should be aware of the dishonest, unethical, and illegal tactics used by my doctors to dupe me into a procedure that I would not have consented to if properly informed and not lied to. Tom Ballard, OD and Larry R. Taub, MD are responsible for lying to me and permanently damaging my vision and injuring my eyes. View their lies here. Tom Ballard, OD and Larry R. Taub, MD stole the quality of life I once enjoyed. You can read some of the complaints I have filed with the Texas Optometry Board and Texas Medical Board Here. These two doctors belong in prison. You can also read about the dangers of co-managed care Here. Below are the dishonest doctors responsible for permanently damaging my vision. Dishonest and unethical LASIK doctors have dug into many levels of the eye care industry, creating a very dangerous environment for patients. They may be teaching at local universities, practicing at your local eye care facility, or even worse they may be on product safety advisory boards, medical boards, or optometry boards such as Randall Reichle, OD in Texas. In many states, including Texas, dishonest doctors are permitted to operate freely due to inadequate legal and health care systems that do not adequately protect patients. I emailed Chris Kloeris, Executive Director of the Texas Optometry Board informing him of his fellow member's misconduct. I also copied my Texas State Senate representatives requesting the removal of Dr. Reichle from the optometry board. Board members are not exempt from following the law and rules of the Texas Optometry Act. The optometry board has continued to protect dishonest doctors, including its own Vice-Chair and it has to stop. View the email. I hope that you have found this website before you have your precious eyes permanently damaged. There are many safe alternatives to refractive surgery. All of which are reversible, unlike LASIK or other refractive surgeries. LASIK is a medically unnecessary procedure that has resulted in the permanently damaged vision of countless patients. For many of these people life will never be the same as it was prior to LASIK. They will have their lives derailed or ruined. They may no longer be able to work, drive, or participate in the hobbies they once had. Many of these injured patients will develop severe depression. Some will succumb to the overwhelming depression and anxiety that accompanies having their vision permanently damaged and commit suicide to escape the distorted vision they deal with daily. The effects of an unsuccessful LASIK surgery are cruel and lifelong. I have suffered from permanently damaged vision since 3/26/2010. 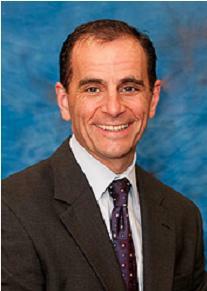 In the first 2.5 years after the first LASIK surgery I had seen 14 different optometrists or ophthalmologists, and have had more than 45 eye doctor appointments in an attempt have my vision corrected or to address vision threatening complications that were a direct result of the surgeries performed by Larry R. Taub, MD. To put that into perspective, in less than 2.5 years I had more than 1.5x the number of eye doctor appointments than in my previous 32 years of uncomplicated vision prior to having LASIK. During the first 2.5 years I also spent more than $11,000 for eye care, medical bills, and other expenses that would not have been accrued had I not had LASIK. Prior to having LASIK my vision care was covered by insurance. I now pay nearly all costs out of pocket. My current pair of contact lenses have cost me $4,000 out of pocket! I also spend more monthly for eye drops than I previously spent for contact lenses and lens care combined. Potential patients should not have to get a medical degree to become properly educated about the risks involved with LASIK in order to make an informed decision and consent to the surgery. Potential patients should be able to rely on the education, experience, and honesty of their surgeon and/or optometrist for this info. Unfortunately this is not always the case. There are doctors in the refractive surgery industry that lie to patients, rely on deceptive advertisement, provide misinformation or withhold information, and skew the presentation of surgical result data in order to trick patients into consenting to a surgery they otherwise would not agree to. Surgeons and optometrists may also place patients at elevated risks without the patient's knowledge or consent. If you have been lied to, mislead, or have suffered any type of negative side effect from having LASIK or other elective refractive surgeries, please file a report with the FDA immediately. I encourage you to read this website as well as others in the Links section prior to talking with any optometrists or ophthalmologists about LASIK or other refractive surgeries. Two very informative websites are Life After LASIK and LASIK Complications. You have no idea what you are signing up for by having LASIK. There are thousands of injured people who will spend the rest of their lives with ruined vision. Read about their experiences here. If you have a bad outcome you will quickly realize that there is no fix. The so called experts will come up empty handed when you seek their help. The FDA that approved your procedure and said it was safe, and that you thought was protecting you will ignore your pleas for help. The laws of your state will likely make seeking legal action against your doctor(s) difficult or impossible. You will also find that your state's medical board or optometry board is not there to protect you either. Board members may have a financial interest in protecting the LASIK industry or they may be practicing optometrists or ophthalmologists who are just as guilty as the doctors they are supposed to protect you from such as the Vice-Chair of the Texas Optometry Board member Randall Reichle, OD who works at Eye Center of Texas. On December 18, 2012 Eye Center of Texas was one of five LASIK facilities to receive warnings from the FDA due to their misleading advertising of LASIK. Read more here. If board members do not have the integrity to be honest with their own patients, do you really think they are going to protect you? You will be left alone with your permanently damaged vision. 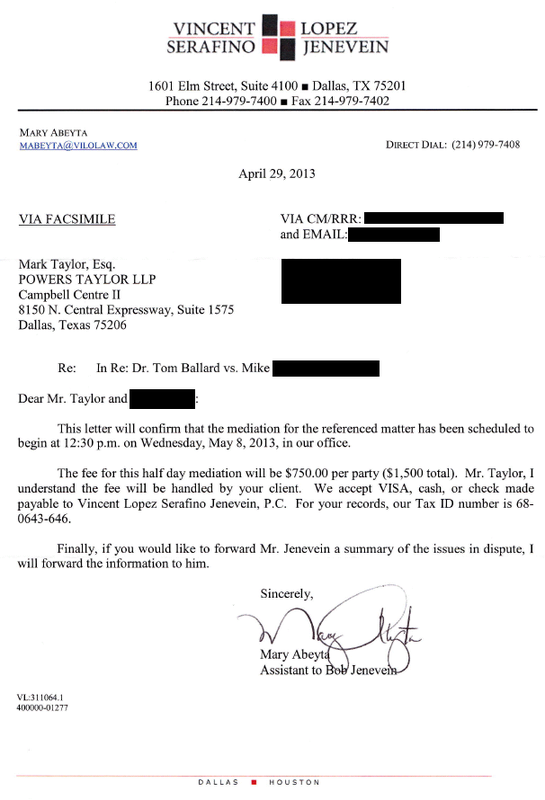 Within three days of first picketing First Eye Care Dallas I was contacted by Dr. Ballard's attorney, Mark Taylor, asking if I would be willing to mediate. Dr. Ballard and Dr. Taub want to avoid a jury trial at all costs because they do not have a shred of evidence to refute my claims. Mediation was an absolute waste of my time. Dr. Ballard and Dr. Taub are criminals and they are cowards. I refused to let them buy their way out of this, or to help hide their illegal, negligent, and unethical acts. They need to be held accountable at all costs and should be stripped of their licenses to practice. This website is updated frequently. Please check back in the near future for updates to the website. Your feedback is greatly appreciated Contact Me. Please protect yourself and your vision. Do not become one of the thousands of LASIK victims. LASIK surgeons are not healers. They leave every single one of their patients with permanently damaged corneas and life long risks of future vision complications. Take the money that you would spend on refractive surgery and use it to see the world and experience life. Buy a nice pair of glasses or take advantage of one of the many contact lens options available such as Air Optix that you can sleep in for up to 30 days, perfect for a camping trip. Use the left over money to take a vacation in the Bahamas, see the glaciers in Alaska or the Pyramids in Egypt. The world is a large and wonderful place when you can see well. Once your vision is permanently damaged, the world becomes very small and uninviting. Look for me outside a First Eye Care facility near you in 2013! I'm easy to spot, I'll be holding the sign below. Feel free to come up and ask me about my experience with First Eye Care, Newman & Taub Vision, the Texas Optometry Board, or LASIK. First Eye Care claims to be an association of optometrists with the shared corporate philosophy "Vision Made Clear." Nearly 50 doctors of First Eye Care at multiple locations were previously informed of Dr. Ballard's illegal, unethical, and dishonest actions with this letter. All doctors failed to respond. It appears that no First Eye Care doctor has the integrity to hold one of their own peers, Dr. Ballard, who serves on the First Eye Care board of directors, accountable for actions that clearly violated such a philosphy. I will make appearances at all First Eye Care locations, informing their patients and the public about how a First Eye Care doctor permanently damaged my eyesight and stole my quality of life. I will inform their patients and the public how other First Eye Care doctors lack the integrity to hold their own associates accountable. If you have been injured and plan to picket the office of the doctor(s) responsible for damaging your vision, and are in Dallas or surrounding areas please contact me. I will be glad to stand outside with you and support your efforts. Your vision has been permanently damaged by a medically unnecessary procedure, do not be afraid to let everyone know who did it. As an injured patient you know the true costs of LASIK. Please inform others before they too sustain permanent injuries to their corneas at the hands of dishonest and unethical doctors. Whenever a doctor cannot do good, he must be kept from doing harm. - Hippocrates. First Eye Care Dallas screens patient submitted reviews prior to displaying them on their website. They falsely advertise their patient satisfaction as being higher than it really is. During a phone call with a DemandForce representative, she confirmed that my review was submitted on 4/22/2012 and requested to be removed by First Eye Care! You can read more about this in the My Doctor's Lies section. Because they refuse to display my review, even though it met all requirements at the time it was posted, and because the Texas Optometry Board refuses to protect the public from these doctors, I will warn the public myself. Tom Ballard serves on the board of directors for First Eye Care, Inc. and has not been removed even though many First Eye Care doctors at all Texas facilities were warned of his illegal, unethical, and dishonest tactics in this letter that I had sent to nearly 50 doctors. I warn you to be extremely cautious if visiting any facility that is part of First Eye Care, Inc. or Infinity Laser Vision Associates! Always get everything in writing and video tape all visits if possible. An honest doctor should have no problem with this. 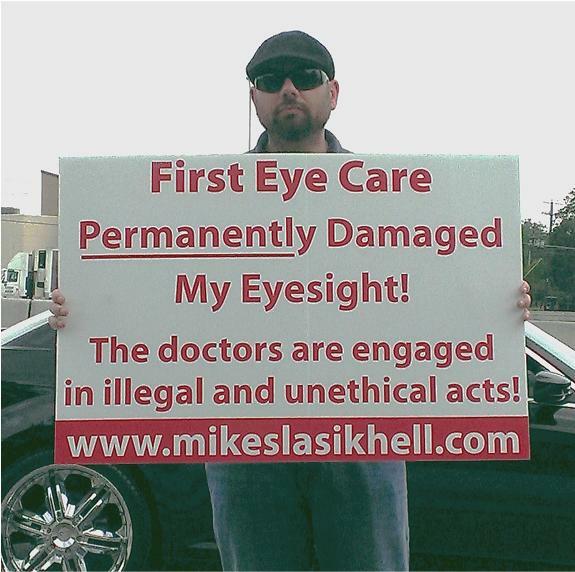 I will continue to make appearances throughout 2013 in front of First Eye Care facilities with the sign below, warning the public until justice is served. The staff at First Eye Care have attempted to violate my civil rights and silence my efforts on multiple occasions by calling the Dallas police in an attempt to have me removed from the public sidewalk in front of First Eye Care Dallas on LBJ Freeway. Each time I was informed that I was exercising my rights and could carry on. I thanked them and continued my efforts. They have also contacted an attorney in an attempt to get rid of me. What these doctors have done is inexcusable and I refuse to let them hide or lie their way out of this. Do not be afraid to stand up for yourself and for others who have been injured! Take your fight to the front lines outside of your doctor's office. Inform others how a refractive surgery has ruined your vision. Do not let your doctor get away with injuring you or a loved one.